I am thinking of it as a way to extend friendships and ways of being companionable while walking. I am imagining the numbers one, two and three to be on our minds as we wander. I walk to a friend (no more than a day’s walk from me) and stay over, the two of us walk together (no more than a day’s walk) to a third person, (unknown to me), we stay over and then the three of us walk (no more than a day’s walk) to my place. It would also be possible to do a version which all happened in one day or two days, according to the time people have. Ian Marshall, Pennsylvania State University. Border Crossings: Walking the Haiku Path on the International Appalachian Trail. Emmanuelle Peraldo, Saint-Etienne. Walking the Streets of London in the Eighteenth Century: a Performative Art? Catherine Drott, Giessen. Maps from the Mind: Rambling London’s City Streets in the Eighteenth century. (Iain Sinclair, Peter Ackroyd and Gilbert & George. Joe Duffy, Manchester. Performative Traces of Traumatic Place. Christian Schmitt-Kilb, Rostock. “In the beginning was the land”: the Poetics of Nature and the Politics of Walking in Recent British Prose. Bridget Sheridan, Toulouse. Walking, Photography, and Writing. Shao-Hua Wang, St. Hugh’s College, Oxford. A Way of One’s Own: the Writer Flâneur/se in Baudelaire and Woolf. Bill Psarras, Goldsmiths. Towards a Twenty-First Century Urban Flâneur: “Botanizing”, “Weaving” and “Tuning” Actions and Senses Through Embodied Media Art Practices. Mark Riley, Roehampton. Navigating the Forest Path: Using Paul Celan’s Poem Todtnauberg as a Field Guide to Walking the Heidegger Rundweg at Todtnauberg. Andrew S. Gross, Erlangen-Nürnberg. Pound, Peripatetic Verse, and the Postward Liberal Aesthetic. Parallel workshops: Walking as Pathology? Ewan J. Jones, Cambridge. John ‘Walking’ Stewart, and the Ethics of Motion. Amanda Klinger, Oklahoma. Nervous London: Pedestrianism and Urban Sensibility in Wordsworth’s Book 7 of The Prelude. Catherine Welter, New Hampshire. A Juggernaut in the Streets of London: Walking as Destructive Force in R.L. Stevenson’s Strange Case of Dr. Jekyll and Mr. Hyde. Nicolas Bourgès, Paris-Sorbonne. The Significance of Enoch’s Walking in Four Funeral Sermons (1703-1738). Isabelle Baudino, ENS de Lyon. Textual and Iconographic Representations of Walking in Marianne Colston’s Narrative (1822). Andrew Estes, Munich. Walking in a Changing America: A Visit from the Goon Squad. Mathieu Perrot, Paris Ouest. Poetics of the passer-by: strolling about the lines in Louis Aragon’s Le Paysan de Paris (1926) and Le Traité du style (1928). Véronique Buyer, Paris 8. Women’s Walking in Four Movies by Michelangelo Antonioni. Sophie Walon, ENS Ulm. Walking to Death in an Indifferent World in Gus Van Sant Cinema: Gerry, Elephant, and Last Days. Tom Pughe, Orléans. How Poetry Comes to Him : An Excursion to Gary Snyder’s Wild Poetics. Catrin Gersdorf, Würzburg. Flânerie as Ecocritical Practice: Henry David Thoreau and Walter Benjamin. Andrew Goodman, Monash. Walking with the World: Towards an Ecological Approach to Performative Art Practice. Sarah Mombert, ENS de Lyon. Writing Dromomania in the Romantic Era: Nerval, Collins, Charlotte Brontë. Françoise Dupeyron-Lafay, Paris Est. The Art of Walking and the Mindscapes of Trauma in Thomas De Quincey’s Autobiographical Works: the Pains of Wandering, the Pains of Remembering. Anna MacDonald, Monash. Remembering through the Senses: Walking and the Recovery of Memory in W. G. Sebald’s Peripatetic Narratives. Karolina Katsika, Besançon. Walk, Feel and Hear: Walking as a Phenomenological Experience in Allerzielen by Cees Nooteboom. Lacy Rumsey, ENS de Lyon. “Hike it and see”: Jonathan Williams, A.R. Ammons and the American “walk poem”. Daniel Acke, Université libre de Bruxelles. The Poetry of William Cliff and the Meaning of Walking. or How Universal Exhibitions Created Flâneurs. Estelle Murail, Paris 7/ King’s College London. “Du croisement de leurs innombrables rapports”: Baudelaire and De Quincey’s flâneurs. Amélie Moisy, Paris Est. Thomas Wolfe and the Urban Night Prowl: Walking, Modernism and Myth. Andrew Patten, New South Wales. The Walking Medium: Between the City, the Text, and the Flâneur. Manila Castoro, Kent, United Kingdom. Undermining the Myth: Why the Street Photographer is not a Flâneur. Gabrielle Finnane, New South Wales, Australia. Walker in the Megacity. Julien Nègre, Paris 7. Thoreau’s Alternative Perambulation: Walking as the Delineation of a Political Spatiality. tea will be served thirty minutes prior to start time. Please RSVP. Performing Landscapes and Identities – the colloquium will consider walking as interrogative, investigative, performative and documentary, with presentations and provocations from a range of practitioners, many of whom have made walks and work in response to contested and changing landscapes, including Newham, Hackney and the 2012 Olympic site. Discussions will interrogate the interface between geographical and sovereign spaces. For more information or to RSVP, please contact Dr Ananda Breed at IPAD@uel.ac.uk. They are looking for papers that engage the conceptual, cultural, textual, and visual dimensions of walking. Contributions may deal with how walking has become an aesthetic program, a form of reflection or a complex, frequently ambivalent metaphor; they may also discuss walking in light of its historical, ideological, aesthetic, philosophical, and poetical implications, or investigate two or more of these aspects jointly. Or they may ask how one can delineate the semantic field of ‘walking,’ which may evoke, among others, the notions of ‘rambling,’ ‘sauntering,’ ‘roaming,’ ‘hiking,’ or ‘perambulating,’ but also of the Aristotelian ‘peripatetic’ and, following Baudelaire and Walter Benjamin, of the “flâneur.” What are the values attached to these practices? How does walking enhance our knowledge of a specific place or environment? Are there differences between walking in ‘nature’ and walking in an urban environment? To what extent has walking reinforced or, perhaps, questioned the distinction between the rural and the urban? If major texts in this tradition, such as Rousseau’s Reveries of a Solitary Walker and Wordsworth’s The Excursion, focus on the countryside, walking is not only, nor even primarily, a rural phenomenon, but is also typical of urban modernity. How has walking as a literary genre evolved throughout the modern period, and, how, following its heyday during the Romantic period, has it been redefined in connection to modernist issues? To what extent does the aesthetics of the ordinary and of chance, which seem to be associated with walking, relate to aspects of postmodern nomadology? Is walking gendered? They encourage submissions from scholars in a variety of fields and disciplines. Interdisciplinary approaches are especially welcome. Proposals for 20-minute papers (title and 200-word summary) should be sent to both Klaus Benesch and François Specq, by email before April 15, 2013. Call for Expressions of Interest in joining. Sunday 16 June – Sunday 7 July 2013. Project initiated by Mick Douglas and Beth Weinstein. A rising awareness of and interest in mobility. A road trip starting and finishing in Tucson, Arizona. Collaborative creative investigation in the space-times of American deserts. Engaging the performing body, the mobile social body, a body of mobile infrastructure, and relations to desert ecologies. Learning from land art. Performance presentations in process and en route, with a finale event in Tucson. Twelve people temporarily collected. This practice-based performance research project aims to enable collaborative peer-to-peer conditions for a group of creative practitioners and researchers to extend their performative practices and generate new works and working relationships that engage with mobility. The Performance Studies International (PSi) conference is enfolded into the middle of the 3-week journey. For the conference, the project collaborators will present a daily morning praxis event in the grounds of the Stanford campus. The project is intended to inform practices for PSi Fluid States 2015 as a mobile and distributed event process. PSi conference attendees and lingerers are invited to submit an expression of interest to collaborate. Travel will be via two vehicles, and overnight camping. Estimated on-ground costs to be shared (excluding PSi conference and accommodation costs) will be US$800, plus camp equipment hire if needed. Whilst preference will be given to collaborators wishing to collaborate in the full journey, we are accepting expressions of interest to participate in only the pre-PSi Tucson to Palo Alto passage (June 16 – 26), or the post-PSi Palo Alto to Tucson passage of the project (June 30 – July 7). Selection will be based on contribution to a collaborative and open process. # # Note for walking artists: whilst the project is dependant upon traversing large tracts of land via vehicles, it is intended that a significant aspect of the creative research focus will be toward experience in landscape on foot. 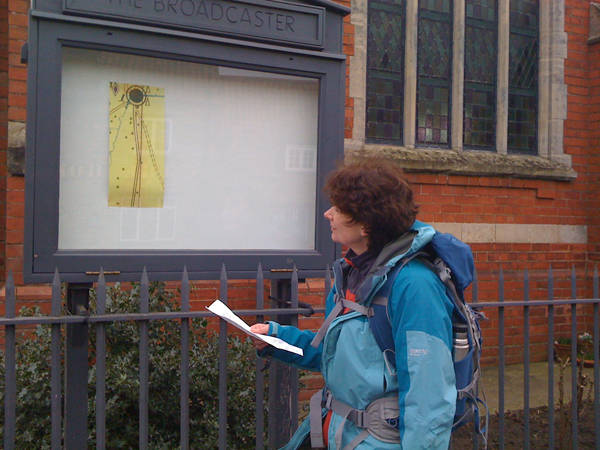 Alison Lloyd is walking at the same time as Andrew Brown on the 23rd March 2013, between two methodist chapels in Lincolnshire. Alison will walk North and Andrew will walk South between the chapels in Wellingore and Waddington. The commission is from the Post Methodists and part of their Broadcaster. Here is a link to the Post Methodists and a link to the walk and booking. Meet at Wellingore, Reading Room & Chapel, High Street, Wellingore, Lincoln LN5 0HW at 1:30pm and walk NORTH to Waddington, The Methodist Chapel along six miles of the Viking Way, with extensive views out across Lincolnshire by way of Harmston, Coleby, Boothby Graffoe, and Navenby, also known as the ‘Cliff Villages’. Meet at Waddington, The Methodist Chapel, High Street, Waddington, Lincoln LN5 9RF at 1:30pm and walk SOUTH to Wellingore, Methodist Chapel along six miles of the Viking Way, with extensive views out across Lincolnshire by way of Navenby, Boothby Graffoe, Coleby, and Harmston, also known as the ‘Cliff Villages’. You will need suitable footwear and clothing for the walk and be prepared to walk the six miles one way. Bring snacks for extra energy, food and drink, and a rucksack to carry it all in. The walks will take place whatever the weather brings on the day. Buses run between the two villages and to provide an added incentive the respective chapels will provide refreshments at the end of the walk.